2 Where exactly where the girls moved from? 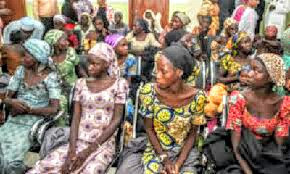 within Nigeria or outside the borders?3, If Sambisa, noted by so many as the home of BH was captured long ago leading to a tour by Oby Ezekwsili and BBOG, and neither her team nor the military that overall Sambisa could sight any off the girls, in whose home were they encamped?4. How come FG has, till date, shielded all the girls from the media? What questions by the media could be more traumatic than being held by Boko Haram all these years?5. How come this batch was received at Villa behinddoors. What really is anyone hiding? 6. How come one of the girls is amputated on one leg. Who carried out the amputation? who administered drugs and care to ensure healing? At which hospital facility was she amputated?7. If indeed Federal Government swapped dreaded leaders of BH for the girls, is there a new plot on the works given emerging possibility of power swing caused by nature? Is BH preparing for something more sinister?8. If BH had been downgraded and their flag captured, does it make sense to release their most vicious leaders? Are those released new creatures of still the persons they were?.. Please share and follow!